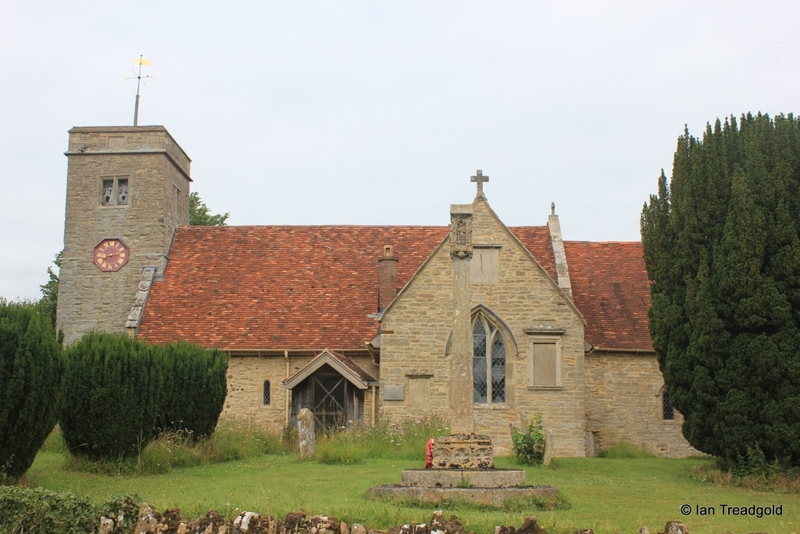 The parish church of St Margaret in Knotting is situated in the hamlet of Knotting in the north of Bedfordshire, just inside the county boundary with Northamptonshire. Parking is available on verges outside the church. 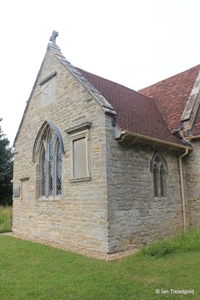 The earliest records of the church date from 1174 when it was a chapel within the parish of nearby Melchbourne although parts of the church have been dated to about 1130 with suggestions of re-use of earlier Saxon walls in the nave. The church is constructed primarily of limestone rubble with some fragments of a reddish stone and clay tiled roofs. 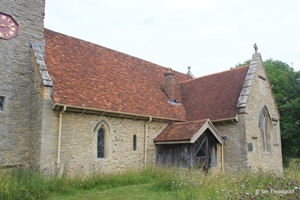 Some restoration took place in the late C19 and early C20 before the church was passed to The Churches Conservation Trust in 2009. The church consists of a chancel, nave, south transept, south porch and west tower. The nave is around 40 feet by 20 feet with the chancel adding 26 feet by 15 feet. The transept is about 13 feet by 12 and the tower around 7 feet square and 40 feet in height. The eastern end of the south side of the nave is occupied by the south transept which was added in C13. To its east there is a small two-light trefoiled window under a pointed arch. The main south window is of three uncusped lancet style windows under a pointed arch which although restored in C17 dates from when the transept was added. 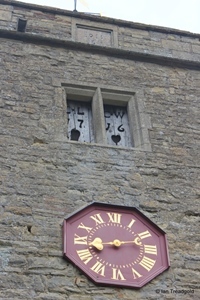 Above the window is a sundial with a painted dial and lettering and iron gnomon. 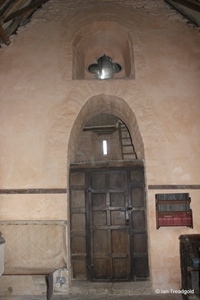 To the west of the porch, the walls show signs of being Saxon in origin with two small windows, a simple round headed lancet to the east and another single trefoiled light under a pointed arch to the west. 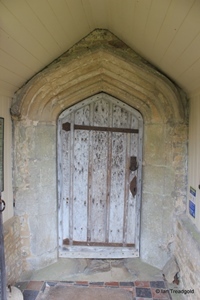 The wooden and masonry porch dates from the mid-C19 when the church was under the care of the Bedford Estates although the door itself may date from the origins of the nave. 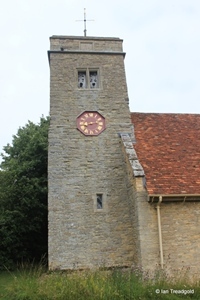 The tower was probably added in the early C17 with a panel on the parapet indicating 1615 as its completion date. It is of two stages with the upper bearing square headed belfry openings. 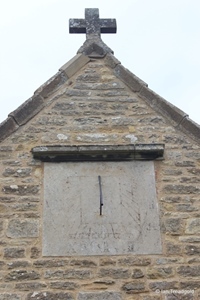 On the south side these contain wooden boards with the inscription C.L.C.W 1716 presumably indicating restoration of this time. Also on the south side is a single handed clock dated to about 1750. 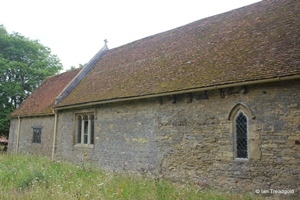 The north side of the nave has two windows and clearly shows the change in building between the presumed Saxon western end and the later work to the east. 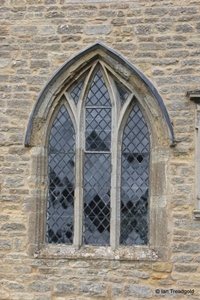 The western window is similar in style to the equivalent window on the south side. 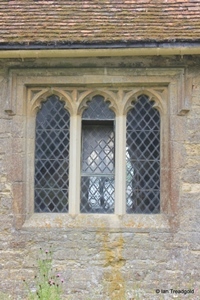 The eastern window dates from the late C15 and is of three cinquefoiled lights under a square head. 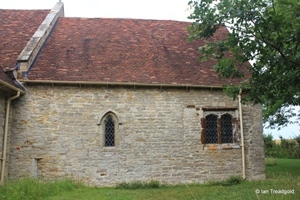 The north side of the chancel has a three light wooden square headed window. The south side of the chancel has two windows, the eastern being of two wide uncusped four-centred lights under a square head. 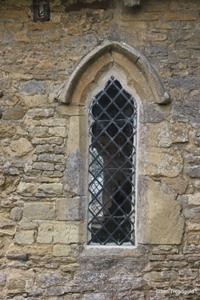 The western window is a simple trefoiled light dated to C14. Inside, the walls have been restored to a reddish hue, a colour found when layers of white limewash were removed. 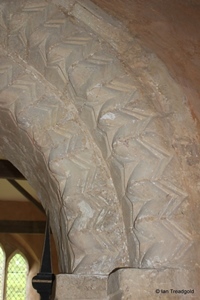 The chancel arch probably dates to the same Norman period as the nave and is round headed with zigzag ornament on both orders. 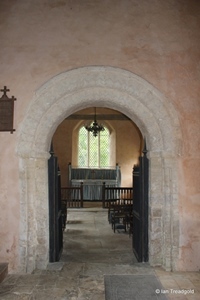 The gates to the chancel were introduced after a shameful series of cockfights on Shrove Tuesday in 1634, 1635 and 1636 took place in the chancel. The Rector, Arthur Alvey, and the church wardens of the time were prosecuted for this and the gates introduced in 1637 to be kept locked other than at times of worship. 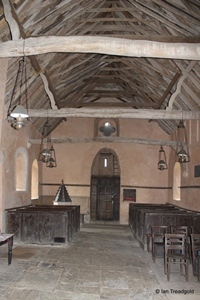 The nave roof dates from 1669 and has two tie-beams. 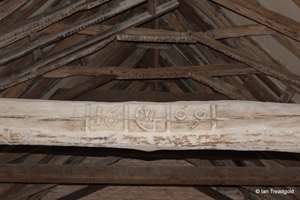 The western of the two tie-beams has the carved date and initials GW. 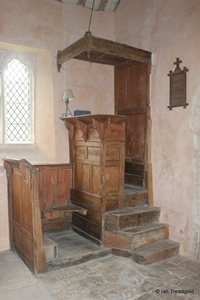 The pulpit is probably from C17 and is unusual in being a double-decker pulpit. The person leading the service took it from the lower level whilst the sermon would be delivered from the upper. Above is a tester or soundboard. The tower arch was the original entrance to the church before the tower was built and widened when that happened. 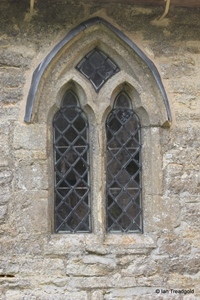 Above is what would have an external quatrefoil west window before the tower was added. 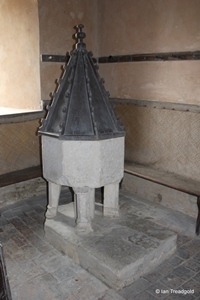 In the south-west corner of the nave is the font, an octagonal stone font resting on four rectangular shafts with a central shaft dating from C14 with an oak cover above from Victorian time. The benches around the font have rush matting as a lining to the backs to prevent the limewash rubbing off.